Thalassemia, as the most prevalent genetic blood disorder, has many associated comorbidities including low bone mass. We studied the comparative effectiveness of alendronate (AL) and zoledronic acid (ZOL) on bone mass improvement in transfusion-dependent thalassemia (TDT) patients a year after treatment. 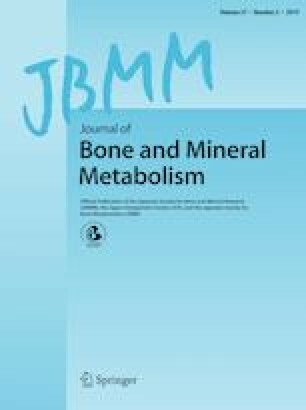 Three hundred seventy-five TDT patients with low bone mass were enrolled in this study. After a year of treatment with either AL or ZOL, a second bone mineral density (BMD) test was ordered to compare the effectiveness of the two aforementioned drugs. Body mass index (BMI), physical activity, sun exposure, and biochemical laboratory data were also considered as associated factors in this study. The BMD test of both groups was almost the same at the baseline and it increased comparably after a year of treatment with AL and ZOL. However, there was a significant difference in lumbar spine BMD delta Z score between both groups of female patients. ZOL was more effective in increasing the lumbar spine BMD of female patients. The choice of bisphosphonates therapy (oral versus parenteral) should be individually selected by considering patient’s preference, compliance and the physician’s decision. Given the longer administration interval, and TDT patients’ compliance issue, it is justified to recommend ZOL as the drug of choice for patients suffering from low bone mass. This study was produced as a part of Haleh Bozorgi doctoral thesis with the specified grant number of 15195 provided by Shiraz University of Medical Science. We thank Shirin Parand at the Hematology Research Center for preparation of the manuscript. The authors wish to thank Sara Dadashzadeh and Mr. H. Argasi at the Research Consultation Center (RCC) of Shiraz University of Medical Sciences for his invaluable assistance in editing this manuscript. Omid Reza Zekavat, Mohamadreza Bordbar, Sezaneh Haghpanah, Forough Saki, Asghar Bazrafshan and Haleh Bozorgi declare that they have no conflict of interest.